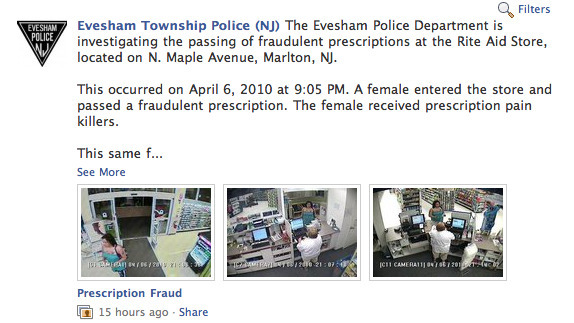 The police force in Evesham Township, a small town in New Jersey has, for the past six months, had a Facebook page. And on it go the mugshots of people caught breaking the law: a car thief, shoplifters, and even a child pornographer have all been named and shamed on its wall. It’s a two-way thing, though–residents can post information up there as well. It’s just announced that it’s adding DUI perpetrators to the list, but there’s a storm brewing over–you guessed it: privacy. Bernard Bell, a law professor at Rutgers University, reckons it’s inappropriate behavior from the cops. “There might be a potential defamation claim where posting a picture and information was negligent and the suspect isn’t a public figure,” he told the Courier-Post. The guilty-till-proven-innocent argument doesn’t quite work, however, as all the information posted on Facebook is already in the public domain–but it could be evidence that Facebook is going to end up as the go-to site on the Internet. Another police department, Gloucester Township, is currently considering the idea. The Police-social media love-in isn’t exactly new–after all, Facebook status updates seem to be the norm for the dumber members of the criminal fraternity, and Plod is wising up to that. Traffic cops in Delhi, India, are also using the site to flag up bad drivers, listing bad drivers’ registration plates, and encouraging people to send take pictures of violations in progress and post them up on the wall. This is followed up by a leisurely issuing of a ticket. The litigious nature of the U.S. means that Professor Bell’s claim will probably be tested out at some point or other. However, judging by some of the messages of support for the police, and the page’s 4,778 fans–it’s worth checking out, if only for the comments beneath the photos. “I saw Vince yesterday and i told him to stay outta trouble. I guess he didn’t wanna listen.. lol” says one of the comments beneath a guy booked for driving under the influence of laughing gas.